Natural Dog Food is best way to keep your pet healthy and help them achieve their genetic potential. Feeding your Great Dane the wrong food can cause illness, and many people believe that feeding the right foods can actually act like medicine. Natural dog foods contain no chemically derived flavors, colors, or preservatives. The AAFCO defines "natural" as coming from natural sources. Natural dog foods do not have artifical chemicals or artifical preservatives, but they can still have things like wheat gluten because it does come from a natural source. A diet rich in fatty food can lead to pancreatitis, obesity, and digestive problems. Feeding your Great Dane doesn't have to be a complicated process, but knowing what dog's need to stay healthy hlep you make the right decisions about how to meet your dog's nutritional needs and keep him from suffering nutritional deficiencies or excess. A well-balanced, nutritional diet should result in an energetic dog with a shiny coat and supple skin, free of digestive problems. Some people choose to feed their dogs the BARF (bones and raw food) diet. This diet consists of raw meat, raw bones, and finely ground raw vegetables and fruit. Proponents say the diet retains a high level of nutrients and enzymes, and it keeps dogs healthier. The diet is free of preservatives, and chewing on raw bones gives dogs a vigorous and engaging activity as well as a thorough dental cleaning. (Never feed your dog cooked bones, especially poultry bones, which can splinter and cause internal injury if swallowed.) Some vets believe the BARF diet is a superior diet to commercially prepared dog food; others are not sure the BARF diet is a good idea for pet dogs. Raw meat is nutritionally superior to cooked meat because it contains a full array of special proteins, live bacteria, and enzymes that are destroyed by heat. These proteins and probiotics are necessary for proper digestion and assimilation of nutrients. Dogs can react adversely to bacteria and/or parasites that could be present in raw meat; for this reason, many vets advise against this diet. Vegetable and fruits must be finely ground to be digestible. Frozen and dehydrated options, while easier, can be more expensive and take up more storage space. If you do decide this is the diet for your dog, here are some tips: Don't give raw Broccoli, Brussels sprouts, Beans, Turnip and Cabbage to the dog food diet, they cause intestinal gas, which you should avoid. Sambal, Onions, Peppers, Tomato, Spinach, and Cucumbers are also to be avoided in the dog food; they don't digest very well. 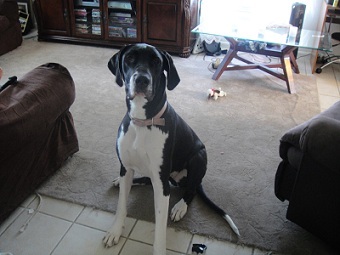 Photo courtesy of 1 of our Loyal Readers the Great Dane "Daisy"
Good Nutrition is essential to the health of your Great Dane. Your Great Dane will grow as much in one year as many humans do in eighteen years. When a dog's bones and tissues are forming this quickly, it is important that the dog receive the proper nutrients in the proper amounts, and she receives the right combinations for each stage of growth. Danes must have a good diet if they are to achieve their genetic potential. Without a good diet Great Danes cannot attain their huge size and impressive musculature. Dogs that are neglected nutritionally may also suffer in their mental development. Since your dog will have to depend on you for what it eats, it is important that you understand what is needed by your Dane and why. Rapidly growing dogs, if fed a diet too high in protein, may put on muscle and tissue faster than their skeletal structures can grow to support the weight. Excesses and imbalances of calcium and phosphorus can lead to bone growth abnormalities in Danes. The other extreme, a diet too low in protein, is just as bad. Without sufficient protein for the muscles and tissues to develop, the Dane can remain spindly and lack the typical physique of the "Apollo of Dogdom". 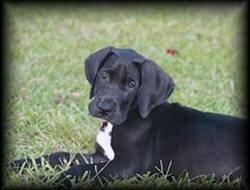 Great Danes do best on a schedule, so start during puppyhood. Small, frequent feedings usually help to prevent bloat. It is also advisable to add a small amount of water to kibble and let it sit and expand before feeding it. Young puppies need to be fed about four times a day with a quality food. As they grow older, the number of feedings can drop to three and finally to two as they approach adulthood. Tip: When you first bring your pup home, continue feeding the same brand food as the breeder. This will help reduce the transition stress that begins when your puppy leaves the only home it has ever known. The terms "natural" and "organic" have specific meanings, as defined by AAFCO, which regulats how pet food is made, and the USDA, which define show organic foods can be labeled. Dog food claiming to be "organic" or "made with organic ingredients" must contain a certain percentage - 100 percent and at least 70 percent, respectively - of USDA-certified organic ingredients grown with no chemicals or pesticides. The farms that grow the ingredients must be certified organic by one of the 97 national and international USDA-accredited agent. Foods that allow the regulations bear the green logo on their labels. Some people enjoy cooking for their dogs and believe that a homemade diet of meat, whole grains, vegetables, and fruits is superior to a commercially prepared diet. Processed dog food is a relatively new phenomenon, and nutrition scientists do not yet fully understand the subtle differences that may exist between the absorption of nutrients in fresh food and the absorption of nutrients cooked out of a food than sprayed back on. Some people also believe that the extremely high heat and pressure that are used to produce extruded dog food may actually alter the protein structure in the meat used to make dry food. A successful homemade diet is well balanced containing just the right mixture of food to provide a dog with essential nutrients. Here is a suggested homemade recipe that provide a full days worth of necessary nutrients. Feed one cup by volume per day per 35 pounds of dog or 15 pound of puppy (5 to 24 months old). Extremely active dogs will require more. There are eight components or elements that make up a sound nutritional feeding program for your Great Dane. If any one of these elements is neglected or ignored, your dog's diet cannot be described as either sound or balanced. These elements are: protein, carbohydrates, fats, vitamins, minerals, water, owner knowledge, and owner consistency. Protein provides your Great Dane with the key amino acids that are so necessary for your dogs progression through the formative stages of its life; the continued sustaining of healthy bone and muscle; the body's own repair functions of bone and muscle; the production of infection-fighting antibodies; and the production of needed hormones and enzymes that aid in natural chemical processes within the dogs body. Carbohydrates supply fuel for your Great Dane's physical motor. Thoroughly cooked grain and vegetable products, in company with processed starches, provide most of the carbohydrates in premium-quality pet food. Along with fats, carbohydrates are the elements in your Dane's diet that furnish usable energy. Carbohydrates are measured in calories. The fats in your pet's diet are a more concentrated energy source than carbohydrates, In fact, an amount of fat will provide twice as much usable energy as an equal amount of carbohydrates. The key vitamins A, D, E, and K are delivered by the fats in your Great Dane's meals, and these fat soluble vitamins help develop and maintain healthy skin and coat. While vitamins are certainly needed by your Great Dane for the general functioning of its body, they are one of those good things that easily can be overdone. All the vitamins a dog normally needs are supplied in a regular diet of premium-quality dog food. Unless your veterinarian indicates otherwise, do not add to the vitamin levels of a good food. Not only do additional vitamins generally do no good, but they can actually do harm. Minerals are important to the normal functioning of your dog. Calcium and phosphorus are needed to develop and sustain healthy bones, teeth, and muscles. Sodium and potassium help maintain normal levels of canine body fluids and a healthy nervous system. Like vitamins, minerals are not needed in huge amounts in your dog's regular diet; they usually are adequately provided by consistent feeding of a good-quality dog food. This should be a no brainer, but you would be surprised the amount of dogs that suffer from dehydration. Clean, fresh water is vitally important to the health of your Great Dane. Your dog needs lots of good water available at all times. Poor-quality, bacteria or algae-filled water is not going to be drunk in the needed amounts by your pet. Make water a crucial part of your pet's diet as any other. Keep water bowls full, disinfected, and readily available. Feeding a giant dog entails giant responsibilities. Not only do rapidly growing young Danes need different rations from average-sized breeds, but your Great Danes health throughout its life may also largely depend on your knowledge of the food you feed it. Your Dane is totally dependent on you for everything it regularly eats. Your awareness of its nutritional requirements and the food that best meet those needs is a major part, perhaps the key part, of your obligation to your pet. Unfortunately, the diet of many dogs in this country is determined by whatever is on sale at the nearest convenience store. Most dogs can survive on such constant variety, but they will not thrive on such a practice. This is especially true of the Great Dane. Find a food that meets the needs of your dog reasonably well, or cook your own food for them, and stick with it. ¼ (½ cup) cup) ground chicken, turkey, beef, or lamb (heart or muscle is OK; liver is OK but not more that once a week). Use one type of meat per meal, and vary the meat at least every three or four days. Combine all ingredients; water can be added. Serve raw or shape and bake at 325 degrees F until lightly browned (20 to 30 minutes). Here, are five popular essential oils that Bell uses frequently. But they are just the beginning of any exploration of canine aromatherapy. Be sure to consult a qualified aromatherapist, herbalist or a veterinarian familiar with essential oils to ensure you are diluting the oils properly and using them safely. Lavender. This oil tops most aromatherapists lists because it is so versatile and immensely safe for topical use. Lavender not only relieves itching, fights bacteria and prevents scarring, but it has a soothing effect, making it an important calming oil. Peppermint. Bell rates this second only to lavender in terms of its overall usefulness. Peppermint oil stimulates circulation, repels insects, reduces motion sickness and zaps bad breath. Niaouli. Bell recommends this as an alternative to tea-tree oil, which is a trendy but powerful healing agent. Both have Australian origins, but Niaouli is gentler, and while it is antibacterial and antihistaminic, it is less likely to irritate skin. German chamomile. Like lavender, this oil is very gentle on the skin, which is where it does the most good. 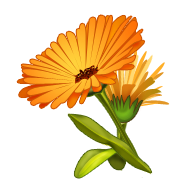 German chamomile can be used on burns, stings, allergic reactions and skin inflammations. Helichrysum. In her book, Bell compares the smell of this essential oil to that of squashed bug. Still, its healing properties outweigh that olfactory assault: A powerful anti-inflammatory that is safe to use on the skin, helichrysum facilitates tissue regeneration. If you want to avoid deceptively marketed "all-natural" products you will need to do a bit of sleuthing. Keep an eye out for commonly used words on packaging and in ingredients lists. Human-grade: All this means is the facility has been certified for human safety. It only refers to the cleanliness-the sanitary conditions that have been considered acceptable for human foods. Animal by-products: Any kind of meat unfit for human consumption.